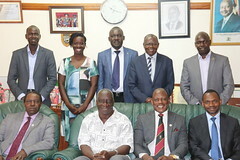 Dr. Tiwonge Davis Manda (Second left) and Dr. Chomora Mikeka (Far Right) pose for a group photo. They were recognized as outstanding young Scientists in Malawi during the AGM 2017. The RUFORUM ‘Vision 2030’ outlines a proposed agenda for how African universities within the network intend to position themselves to improve agricultural higher education, science, technology and innovation in Africa by the year 2030. The ambition of the agenda is to harness the discovery, engagement and learning of vibrant transformative universities to catalyse sustainable inclusive agricultural development to feed and create prosperity for Africa. Under this, the strategy has made six commitments that relate to student learning; research excellence; community engagement; innovation; knowledge generation; and policy dialogue and reform. In this article, I would like to exclusively focus on how the Vision 2030 creates an opportunity for African universities to play a critical role in creating inclusive growth in Africa through its greatest resource- the youth. This declaration radicalises the role of young people in our society today. It realises the ability engraved in this category of the population; looking at young people as the leaders and drivers of economic break throughs for the significant future. A scan of the African youth, indeed shows a lot of promise. Africa is endowed with a wealth of great young minds, who continue fight for progress and growth. The likes of Kelvin Doe come to my mind. This young Sierra Leonean engineer, who is fondly known as DJ Focus amongst his peers, built a generator and his own radio station at the tender age of 13. William Kamkwamba, commonly known as ‘the Boy who harnessed the wind’, also comes to mind. Born in a rural village in Central Malawi, the innovator gained international fame when he built a wind turbine to power electrical appliances in his family home at age 15. The internet is awash with young African entrepreneurs and innovators with simplistic yet innovative solutions to the everyday problems the Africans face. But where do those solutions go after they are celebrated in global events and conferences? How are they fed back into the system and scaled up for wider use by the Africans for whom these innovations were made? I believe that universities have a great opportunity to harness and NOT muzzle exceptional young talent for the greater ‘African’ good. Universities are primarily seen as the creators, testers, and sites for the evaluation and application of new knowledge. In other words, universities are meant to be ‘research engines’ for science, industry and society. African universities thus have an opportunity assist young people to refine, test and improve innovative solutions. This, in turn, could help them to fully and actively participate in achieving sustainable development at continental level. Beyond sustainability, helping young people make their innovations inclusive also comes into play. Most innovations birthed by rural African youth are ‘home grown’, this means that they are developed for resource-constrained communities who best embrace solutions that fit within their context. A good case in point is a University of Malawi recent graduate, Mickson Faluweki, who devised a bicycle powered phone charger that allows people with bicycles to charge their mobile phones as they ride. His innovation fits right into the Malawian context considering that only 11% out of 17 million people have access to electricity nationwide; whilst about 45% and 47% own mobile phones and bicycles respectively. This invention allows even those without access to electricity to still be part of the digital revolution that has swept the globe at an alarming speed. Thus universities have a role to play in encouraging scientific advances based on the local realities of communities. Lastly, while universities have a lot to do to nurture innovation amongst young people, there is also a lot to be done on the policy front. Specifically, there is need for university to engage policy makers to support innovation and address policies that have traditionally inhibit transformative change. Enhancing the capacity of the university to support innovation and creativity amongst young people as well as the policies related would contribute to the creation of a prosperous Africa based on inclusive growth and sustainable development.